The Atlanta Public Schools recently adopted the calendars for its district schools for the 2019-20, 2020-21, and 2021-22 school years. The calendars can be viewed here. 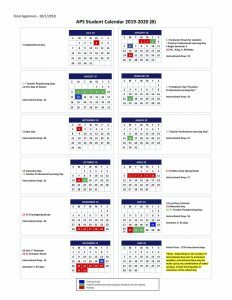 The calendars are a departure from the school year calendar of the past several years with a start date of the 2nd Monday in August and four-day weekends in October and February for students, with school ending prior to Memorial Day. While historically we have generally followed the APS school calendar, as a charter school, ANCS has the flexibility to set a school year calendar that best meets the needs of our students. Before making a final decision on the ANCS calendar for the 2019-20 school year, the ANCS leadership team and board want to solicit your input through your responses to the questions on this survey that will be open through Friday, November 9. The ANCS leadership team will consider these responses prior to presenting a draft 2019-20 school year calendar to the ANCS board at its December 2018 board meeting.